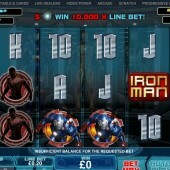 Fans of the iconic Playtech slots, Iron Man, and its follow up slot release, Iron Man 2, will have to wait no more. The third installment in the popular Marvel comics slot release series is here! Iron Man and Iron Man 2 have proved something of a huge hit for online slot developer Playtech and it is no surprise that as the movie blockbuster Iron Man 3 was released, Playtech wasted no time in ensuring that its slot equivalent was launched shortly after. Iron Man 3 is a 5-reel, 25-payline slot release with images gleaned from the Hollywood blockbuster, and, to be blunt, if you liked its predecessors then you should get on board right now. On the flip side, if you did not enjoy Iron Man and Iron Man 2 then you might as well close the door behind you when you leave. The most exciting feature in Iron Man 3 is the Hall of Armor Free Games Bonus. This not only gives you the chance to win free games but it also gives you the power to choose what sort of free games bonus you opt for. You can trigger this bonus by hitting three or more Iron Man Scatter symbols across the reels. Once the Hall of Armor Bonus has been triggered, you will be given the opportunity to play one of three bonus games to win free games. These come in the form of the Iron Man Mark 42 Free Games Bonus, the Iron Patriot Free Games Bonus and the War Machine Free Games Bonus. In the Iron Man Mark 42 Free Games Bonus, you will be awarded with 10 free spins and Freezing Wild symbols. Any Wild symbols that appear on the reels during these free spins will remain frozen on the reels for three spins. 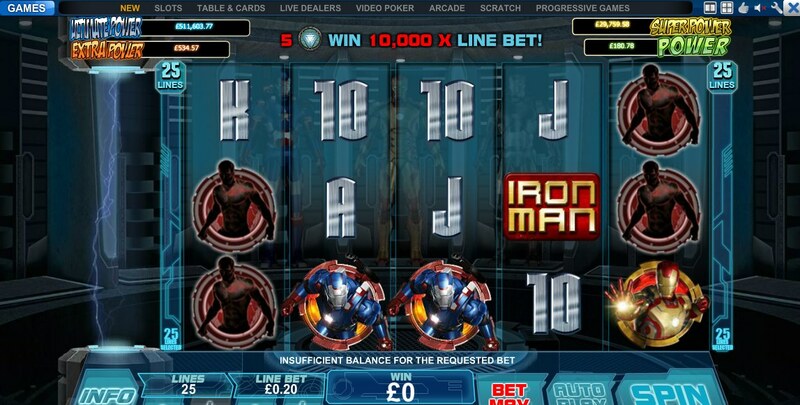 If the Iron Man Mark 42 symbol appears on the central reel then you will be awarded an extra three free spins. The Iron Patriot Free Games Bonus awards you with 15 free spins and a Dynamic Multiplier with a value up to 5x. The multiplier value begins at a random value between 1x and 5x but this will increase by 1 every time the Iron Patriot symbol appears on Reels 1, 2, 4 and 5. If it does not appear then the multiplier value will decrease by 1. You can also earn an unlimited amount of extra free spins if the Iron Patriot symbol appears on reel 3 during the free spins. As part of the War Machine Free Games Bonus, you will be handed 8 free spins with Random Wilds. Before each free spin, the War Machine will appear on the reels and turn three symbols randomly Wild. You will earn 3 extra free spins if the War Machine symbol appears on the middle reel during the free spins. All Systems Go For Bonus Cash! There is also an All Systems Go Re-Spin Bonus that is triggered when you hit the Iron Man Mark 42 symbol on Reel 1, Iron Patriot symbol on Reel 3 and War Machine symbol on Reel 5 simultaneously. These Scatters will remain fixed on the reels for just one re-spin. The win potential isn’t huge but it’s a nice little feature to keep an eye out for. Iron Man 3 is a slot that delivers exactly what you think it will. It is a solid Playtech slot release that Marvel slots fans will embrace. There are some nice free games features included and even though there is the potential for more to be added, it’s a decent slot that is worth playing. There is, of course, the added bonus of triggering the Marvel Mystery Jackpot that is linked in to all Marvel comics slots developed by Playtech.